Rome Ligorio, Lafreri, Duchetti and Orlandi, 1558-59 and 1577. Two editions and several sub-editions were published in Rome, each one of them with the title Nova descriptio totius Hungariae. The first edition had two sub-editions, and of the second, a few copies have survived. Of the five sub-editions of the second edition, four have copies in existence. All of them are significantly smaller than the original Tabula Hungariae, about half its size, and all of them were copied using copper plates. The first edition was made by Pirro Ligorio (1496-1583), and two sub-editions are known. This map wasn’t copied from Valvassore, suggest the differences in the used names. The only known copy of the “A” sub-edition (1558) was destroyed during World War II, in Wrocław. Of the “B” sub-edition, made a year later, copies are kept in the British Library, the Royal Library of Madrid, the Library of Vatican, the Hellwig-collection in Bonn and the National Széchényi Library. The “A” sub-edition was published in 1558 by Antonio Lafreri (1512-1577). Neither the creator’s, nor the publisher’s name can be found on it. It differs from the first edition both in size and content. One copy has survived, but it was also destroyed in Wrocław. The “B” sub-edition (1559) shows similarities with the original Tabula Hungariae and Ligorio’s first edition. Copies of this are kept in the British Library, the Library of Vatican and the National Széchényi Library. The “C” sub-edition only differs from the “B” in that the name of Pécs (Quinque Ecclesiae) is shown. A copy of this is kept in the British Library. The “D” sub-edition was published after Lafreri’s death, by his nephew, Claudio Duchetti (?-1585). The text ‘Rome Claudio Duchetti Formis’ was added to the printing plate. The only known single-page copy of this can be found in the National Széchényi Library. The “E” sub-edition was published by Giovanni Orlandi (worked 1600-1604), who bought the printing plates after Duchetti’s death. He had the text ‘Joannes Orlandi formes Ro[mae] 1602’ carved onto the plate. He didn’t add anything else to the map. It is known to be the latest edition of the original Tabula Hungariae. Its existence wasn’t even presumed until it appeared in 1985. It is extremely rare as a single page, copies are kept in the Hellwig-collection and the National Széchényi Library. These Roman editions didn’t use the same source, therefore the relationship between them is only apparent. Their common characteristic is that they mostly survived in the unique type of atlases invented by, and later named after Lafreri. International literature calls these unique “composite” atlases I[talian] A[ssembled] t[o] O[rder]. Lafreri, who was also a book trader, offered to arrange currently available copies in volumes, in relation to the financial status of his customers. Therefore, the content of these atlases varied highly. However, these atlases helped certain maps survive that would have disappeared as a single page. 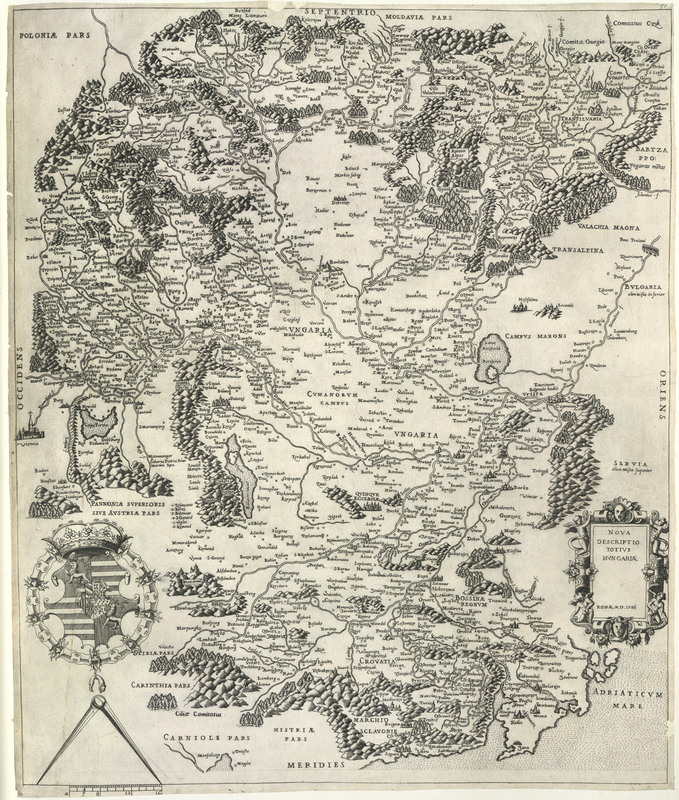 Later, Orlandi has also made similar atlases.